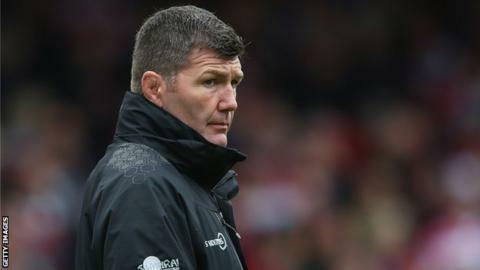 Exeter head coach Rob Baxter says it is "scary" that his side needed a record-breaking eight bonus-point wins in a row to seal a home play-off semi-final. They finished the regular Premiership season on a 15-game unbeaten run, but only secured second on the final day. Until Exeter's streak, no side had ever achieved more than six successive maximum-point wins in the top flight. "It shows you the quality of the Premiership and how well we've had to do," Baxter told BBC Radio Devon. "It's still a bit scary when you look back and think. If any one of those eight successive bonus-point wins had been losses, we might well be sitting here in third and going away in the semi-final." The Devon side host reigning champions Saracens in the last four on 20 May, as they look to reach the Premiership final for the second year in a row. While Exeter have no game before then, Sarries play French club Clermont Auvergne in the Champions Cup final at Murrayfield on 13 May. "Whether we play Saracens next or we play them later, we've got to do it at some stage, so I'm quite looking forward to bringing them to Sandy Park," added Baxter. "We've actually had to put that run of games together to be where we are now, and that gives the players great credit for how they've held that together over such an extended period."